DeforestACTION highlighted as global best practice in new education book | Collaborate for Change! 'Innovate! Collective Wisdom from Innovative Schools' featuring Michael Fullan, Sir Ken Robinson, Dan Buckley, Will Richardson and loads more. All funds raised from the sale of this book will go directly to the DeforestACTION project. It was a major hit at the BETT Show in London, with the first print run completely wiped out in only three days. The new book “Innovate! 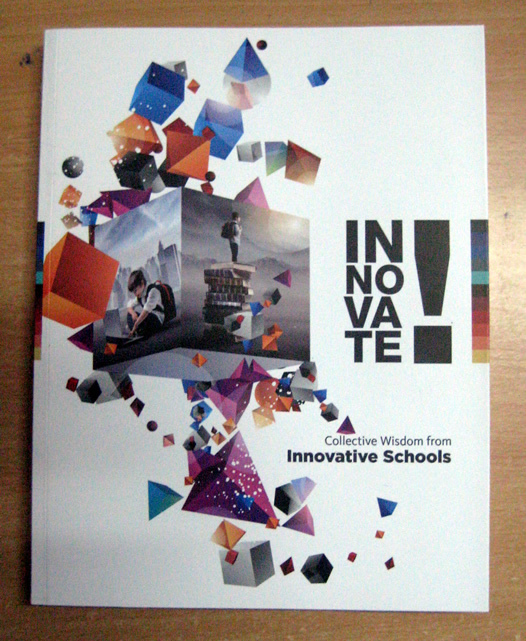 Collective Wisdom from Innovative Schools” features the best examples of educational innovation from across the planet, and powerful ideas from the leading educational ‘gurus’. It is a must read for anyone in education. Perhaps best of all, DeforestACTION is featured throughout as an exemplar of education best practice, and all proceeds (yes, 100% of money raised) from sales of this book go directly to DeforestACTION. This is good news for young people around the planet who are continuing to fight deforestation and protect the endangered species including the orangutan. The book was written in a very unique way. Over 400 educational leaders collaborated across four days, sharing their best ideas, inspirations, quotes and case studies in an uber- OneNote document. This process allowed the distillation of the most current, cutting edge educational thinking from the best in the world, quickly, powerfully and simply. By leveraging the power of cloud technologies, and the single most powerful educational software tool – OneNote, this book is groundbreaking, not only in what it contains, but also in how it was created. The book will soon be available through Amazon and other online booksellers. DeforestACTION explained with examples of student work and great links to teaching and learning ideas. Well done Sean! Love the use of OneNote. Mate I’d be happy to buy! I’ll keep an eye out on Amazon for it. Not sure if you knew but my father passed away August last year. The LIC and eLearning Branch staff bought some plots of land through DeforestACTION in his name. He hated flowers being given. Thought they were a waste. This would have made him proud. You’re doing great work. Keep it up. Cheers! I’ve arranged for a few copies to be delivered to LIC addressed to you. Thanks for supporting the project. It’s going to be an amazing year. We’ve got a film crew who will be making regular web shows about it, so people will get a much better idea of what’s happening on the ground.